The rise of ecommerce has placed physical retail stores under tremendous pressure. As the retail landscape evolves, we believe physical retail locations actually present competitive advantages and opportunities for sellers that are willing and ready to take appropriate action. If you own and operate one or more brick and mortar storefronts, this article will help you understand how to take advantage of changing retail conditions and grow your revenues and profits by making your in-store inventory available on major online shopping sites including Amazon, Walmart Marketplace, eBay.com, Jet.com, Google and your own website. Local inventory that can be sold online to nearby consumers. Online-only resellers often get shut out by brands who already have too many sellers listing their products online. Having your own physical store means you are much more likely to access and merchandise products that you can make available for sale online. In an effort to expand margins and protect brand equity, an increasing number of brands are cracking down on the ability of brick and mortar retailers to list their products on 3rd party marketplaces including Amazon, Walmart.com and Jet.com. Even if that's the case for one or more of the brands you carry, you still have the most important channel of them all -- your own online storefront. Consumers in close proximity to your physical retail store are likely searching online. We see a major opportunity to make this conveniently located inventory available on a simple Google Search. Our favorite analogy to explain the value of your own online storefront is to imagine that for up to 24 hours per day there are, on average, more motivated shoppers in your online store than your physical store. These visitors know what they want and they know you have it, they have clear purchasing intent. They don't require much or any assistance and you therefore don't need to support them with expensive overhead. Imagine attracting 500 visitors per hour to your online retail store. Breaking it down to a science, you know that 3 out of every 100 visitors will make a purchase and your average transaction value is $35 at 20% gross margin net of shipping costs. You're making $105 gross profit per hour or $2,520 per day. Now it's just a numbers game, it's time to optimize. With the tools at your disposal, you make a few changes that results in 4 out of every 100 visitors making a purchase, you're now making $3,360 per day in profit. There's no reason why your inventory should be sitting idle in a store waiting to be purchased by local shoppers. With a few clicks you can get each of your SKUs listed to major online sales channels and you can ship directly from your store. ... our software centralizes everything, and we're here to help you every step of the way. Every time a sale occurs, online or offline, you'll be able to automatically keep track of inventory availability to avoid overselling by connecting your POS (Point of Sale) with Zentail. By identifying the best-selling products online, you can avoid the risk of stocking your retail store with slow-moving inventory. 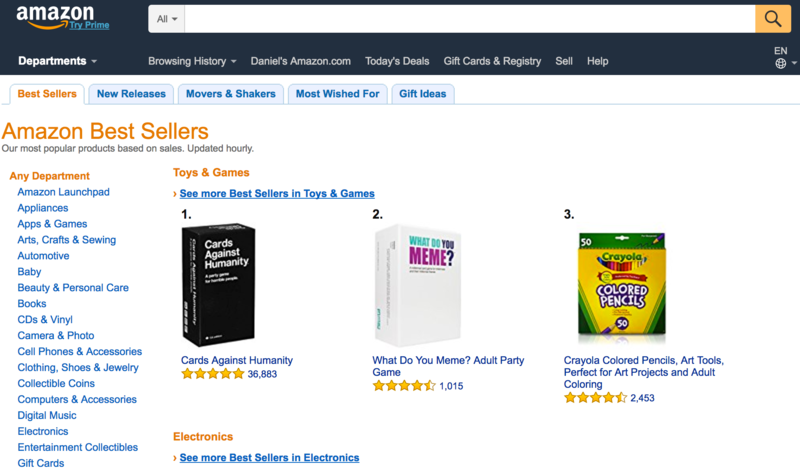 Here's a list of Amazon's "biggest gainers in sales rank over the past 24 hours.."
Here's a list of Amazon's "most popular products based on sales.."
Here's a list of Amazon's "products most often added to Wishlists and Registries.."
You get the point. There's a lot of great data online, use it to your advantage. We're helping brick and mortar retailers leverage our technology, insights and relationships to optimize online and offline sales. If you operate one or more physical retail locations, we would love to help you. Zentail is a multichannel software platform that makes it easy to sell on Amazon, eBay, Walmart Marketplace, Jet.com, Google Shopping, Shopify, Bigcommerce and a growing selection of channels. Centrally manage product information, listings, inventory, orders, business analytics and reordering from one beautiful interface. Get more done faster.